You can’t call yourself a tycoon if you only have one small restaurant to manage. 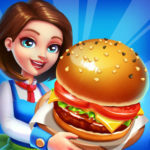 Cafe Tycoon is a challenging cooking and restaurant simulation game created by AppOn for Android devices. The game starts you off with a small café of your own. Here, you will have to lead customers to their seats, take their orders, cook and serve the dishes, collect their payments, and clean up. That’s a lot of work for just one person! If that’s not challenging enough, you have to serve all the guests and ensure they all leave happy while working under time pressure! If you manage to juggle all of that, though, you will be rewarded with gems and coins that you can use to open up cafes in new locations. Soon, you will be managing an empire of cafes all over the globe. 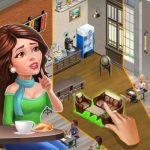 You have your work cut out for you, so make sure you read our Cafe Tycoon tips, cheats and tricks, that we present you in a complete strategy guide! To be honest, you don’t really need to actually play. You just need to log into the game at least once per day in order to claim your daily rewards. You receive varying amounts of gems, the game’s premium currency, for each day you login. You earn more rewards for consecutive logins, with 50 gems waiting for you every day after the third day. If you are a free player, you will need all the free gems you can get your hands on, so make sure you take time to at least log into the game daily. If you break your login streak, your rewards will reset, and you will have to start from the Day 1 reward all over again. Make sure you don’t miss a day! Since Cafe Tycoon is a time management game, you will need to be strategic in how you work. Every second counts, so you cannot afford to wait for your customer’s orders. Even before you let the first customer in, quickly open up the cooking menus and prep meals ahead of time. This way, you will have food ready to serve as soon as your first customer gives out his order. Make sure you cook up another batch as soon as you pick up an order as well. Making this a habit even in the lower levels will help you keep up with the demands of customers in later stages of the game. Another way to save time in the game is to queue up your actions. You don’t actually have to wait for your character to finish whatever he is doing before giving another task. You can go ahead and tap on the next task you want him to perform and you will see a green circle with a number appear. This indicates the order in which your character will perform the said tasks. You can queue up as many tasks as you can, and your character will follow them in the order you give. For example, if you have a table waiting for cleanup and you have a customer waiting for his order. You can tap on the dirty table, tap on the food item, then tap on the customer, and your character will automatically perform all three tasks consecutively. Getting a perfect score in Cafe Tycoon means completing the stage with a 100 Happiness rating. You can see the Happiness bar at the top of your screen, as indicated by the yellow smiley face. You need to get three stars in every stage in order to gain the Perfect bonus, which is a few extra gems. This means ensuring that each and every customer leaves the café completely happy. If you get 99 Happiness, you will only get a two-star rating and will not receive any bonus reward at all. The levels in the game are played in terms of days. Since your character does not travel through time, that means you will not be able to return to easier levels to aim for a Perfect rating. There will be no do-overs and if you fail to get 100 Happiness, that’s a gem bonus that you miss forever. This is one of the reasons it is so important that you completely focus in each level. The levels will continue progressing in difficulty, regardless if you are ready to move on or not. Even if you do not receive a Perfect rating, you will still be able to get a 40% coin bonus at the end of each completed level by watching a video advertisement. Make sure you take advantage of this every single time because, as we mentioned, you will not be able to return to the same level to try again. That means you have a limited amount of time to earn a much coin as you can in order to purchase upgrades for your café. You need to make sure you will be able to afford the upgrades you need in order to keep up with the increasing difficulty level. Another thing you should keep in mind is that there will be a three-hour cooldown for the ad offer after three consecutive levels. You may want to take a rest in order to ensure you have the ad offer available after each level. Gift boxes are purple presents that will randomly appear somewhere inside your café. They will only be available for a few seconds, so make sure you tap on them as soon as possible. These contain random bonuses that will help you complete levels quickly. Some bonuses include automated coin collection, speed boost, and even experience bonuses. Even if a gift box will take you out of the way, make sure you still make time to pick it up. It may contain just the bonus you need in order to secure that Perfect rating. When you start the game, you only have access to one location, and there will be a padlock icon on all other cafes on the map. If you want to unlock the next location, you will first need to meet the level requirement on the current café. For example, the New York location, which is the second café on the map, will become available when you reach level 9 on the default café. Once you reach level 9, the padlock will disappear, and New York will be available for download. Unfortunately, that does not mean you can play in New York right away. You will still need to purchase the new location before you can start playing there. The New York café costs 1500 coins to unlock. That’s a pretty steep price if you realize how little you earn in each stage. It is a necessary purchase, though, because this is the only way you can play easy levels again. Like we mentioned before, you need to make sure you can get a Perfect rating in every level. Instead of risking a one- or two-star rating in the higher levels of the first café, it is better if you unlock New York and practice in its lower levels. This will give you time to master managing your tasks before taking on advanced levels. In between levels, you will see your to-do list on the left side of the screen. Tap on it and you will see a list of recommended upgrades. You don’t really need to follow whichever upgrade is on top if you don’t feel it will be beneficial. The purpose of checking your to-do list is to claim your rewards. Every upgrade you make has an equivalent gem reward. If you just purchased an upgrade, make sure you go back to your to-do list to claim your free gems. The game gives you the option to purchase a boost by spending gems. Free gems are hard to come by in this game, so you don’t want to squander them on one-time boosts. Hold off on purchasing any boosts until you reach advanced stages in a location and are sure that you won’t be able to get a Perfect score. Over reliance on boosts will only build bad habits, anyway. If you cannot complete an easy level without using a boost, imagine how much more difficult it will be for you to complete later stages without them. 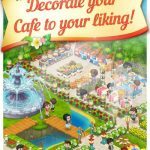 After playing a few levels, you will quickly realize how difficult it is to earn coins in Cafe Tycoon. Coins are needed for upgrades, so you will find yourself struggling to afford everything. When upgrading, you should spread out your upgrades across the different facilities in your café as well as the recipes. Upgrading recipes will increase your earnings, but that does not mean you should just focus on them. You need to be able to ensure that everything in your restaurant runs efficiently or you will end up with a lot of angry customers. When upgrading facilities, prioritize those that are often used. You can just upgrade one or two tables first and just ensure you clean up right away, so you can have your next customers sit in the same upgraded tables. Drinks are rarely ordered, and they automatically refill themselves, so you won’t need to spend on it right away. Managing your upgrades properly will help ensure you maximize the use of the coins you earn from each level. Cafe Tycoon is actually pretty aggressive when it comes to ads. You get an ad almost every time you switch to a different screen. You even get ads when trying to exit from the game. While you can avoid this onslaught of ads by simply playing the game offline, it is better if you stick with it. As we mentioned earlier, you get the option to earn some more coins by watching an ad after completing a level. There is another way you can earn some more, though. When you tap on the plus sign beside your gem or coin counter, you will be taken to the in-game store. Here you can purchase gems using real money or purchase more coins by spending gems. If you tap on the gem tab, you will see a button for earning free gems by watching a video. You will earn 20 gems for each ad that you watch. If you head into the coins tab, you will also have the option to watch an ad in exchange for free coins. You earn 25 coins for every ad that you watch. With that in mind, it is actually more efficient for you to watch the gem offers than the coin offers. Watching ten gem ads will give you 200 gems which is equivalent to 400 coins. On the other hand, watching ten coin ads will only net you 250 coins. You can watch as many ads as you want. If the game says there are no more videos available, you just need to wait a few minutes then tap on the ad offer again. If watching a lot of ads sounds like a mind-numbing task for you, you have a third option. You will notice a third tab that is labeled FREE when you visit the in-game store. Tap on it and you will see three buttons. The first one is another ad offer button. The third button is a one-time reward for visiting the game’s Facebook page. What you are really after is the middle button which takes you to the TapJoy offers screen. Here you will have the chance to earn hundreds, if not thousands, of gems for free. The catch is that you will have to perform the task indicated by each offer. The most lucrative ones are those that require you to install another game and reach a certain level in those games. It sounds like a lot of work, but you will at least be playing instead of staring at video advertisements. You might even find yourself even enjoy one of the games you are asked to play. Keep in mind, however, that the rewards will only count if you have not played the same game before. 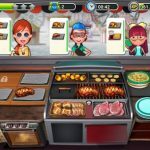 Are you ready for the most challenging restaurant management game? Just remember everything you learned from our comprehensive Cafe Tycoon guide and you will be building an empire in no time!